Body by Science challenges everything you thought you knew about exercise and takes you deep inside your body’s inner workings – all the way down to the single cell–to explain what science now knows about the role of exercise in human health. With the help of medical diagrams and step-by-step photos, exercise scientist Doug McGuff, M.D., and weight-training pioneer John Little present a revolutionary new workout protocol that fully leverages the positive effects of high-intensity, low-frequency weight training, while avoiding the negative effects of traditional aerobic-centric exercise. If you buy only one book on exercise this year, get this one. If you buy only two books, get a second copy of it because you’re going to want to share it with friends, and if you’re a trainer you’re going to want to keep one at work to show clients. Body By Science explains the how and why of high intensity training, balancing enough scientific background to convey key principles and concepts without overwhelming the lay reader, and practical in-the-gym how-to. It is well organized, well researched, and well written, and an enjoyable and informative read. Every one of its eleven chapters contains a wealth of information, clearly explained with the assistance of numerous graphs and diagrams. All of this is backed up by properly performed studies published in reputable, peer-reviewed scientific journals, comprising nearly 30 pages of references contained at the end of the book. Body By Science goes into great detail on the dose-response relationship of exercise and proves just how little high intensity exercise is actually required for best results – far less than many people believe – also backed up by scientific research and the results of a combined 30 years of supervising and tracking the progress of thousands of trainees through tens of thousands of workouts. While the book is not heavy on routines – and once you’ll read it you’ll understand why it doesn’t need to be – it offers a solid starting point along with recommendations for variations using different equipment and for more advanced trainees. It also covers the appropriate use of advanced high intensity training methods such as forced reps, partials, static holds, rest-pause, negative-only, SuperSlow and Max Contraction. Body By Science also explains the numerous genetic factors determining individual muscular potential and response to exercise, and how this information can be used to fine tune your workouts to get the best results possible. The chapter on genetics also contains an interesting discussion of epigenetics – how high intensity strength training influences the expression of your genes. Chapter 9, The Science of Fat Loss, destroys numerous myths while explaining how training, diet and other factors combined to produce discriminated fat loss. It further debunks the popular misconception that aerobics or “cardio” are effective or even necessary for fat loss. Chapters 10 and 11 address the training requirements of athletes and seniors and how the concepts and principles explained in the book should be adapted for those populations, including specific routines for football, hockey, baseball and golf. Chapter 10, The Ideal Training Programs for Athletes, also addresses numerous popular misconceptions about skill training, conditioning, stretching, warming up, and cross-training. Chapter 11, The Ideal Training Programs for Seniors, explains the numerous benefits high intensity strength training has for seniors, including how strength training reverses the effects of aging on the expression of numerous genes. All in all, Body By Science is one of the best HIT books I’ve read in a long time, and I highly recommend it. 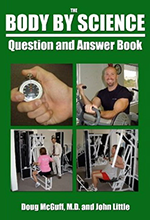 The Body By Science Question and Answer Book contains a wealth of information on proper strength training that will serve the trainee well throughout his or her life. In this section we examine and elaborate on how proper strength training contributes to the total health and fitness (not that these two concepts are co-joined) of the human organism. Topics such as layoffs from training, VO2 Max testing, cardiovascular health, and other (for the moment more popular) approaches to it are examined and contrasted with resistance exercise. In this section we examine what is really required (as against what is popularly assumed) for human beings to make their bodies bigger and stronger. We also revisit the genetics issue and offer some insights that we have found through training our own clients on a one-on-one basis that have proven helpful in building muscle when other approaches have failed. In this section we take an in-depth look at how the trainee can deal with issues ranging from pregnancy to the common cold, in addition to presenting our approach to rehabilitating a host of ailments ranging from lower back pain to tendonitis. In this section we answer questions about all aspects of training. Once the workout starts – and even after its finished – the trainee encounters many new experiences, from shakey limbs to post workout soreness (and many more besides). These issues are all addressed in this section of the book. In this section we examine what a healthy diet for humans truly consists of and also go into some depth on the role of insulin in the big picture of human health. In this section we examine the concept of whether or not athletics – as a “conditioning” activity – is a safe option, and how to proceed with one’s athletic endeavors in a manner that will augment (rather than hinder) one’s performance. In addition, we scrutinize some of the coaching folklore that has endured (needlessly) in the athletic world. 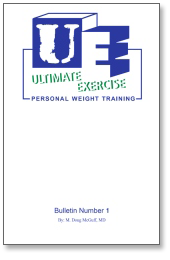 In this section of the book we look at your exercise program with an eye toward keeping it safe over the long term. Issues such as breathing, gripping, exercise-induced headache, and recovery are covered (among many others). The reader should know by now that it is our belief that proper strength training is something that every human being should do in order to maximize their functional ability and to live as healthy a life as possible. Hopefully this book will provide the reader with additional reasons and intellectual ammunition as to why this is so. 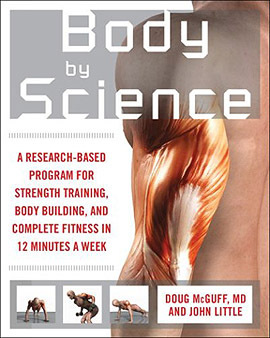 UE-1 is Dr. McGuff’s first published work on high intensity strength training. Read the groundbreaking book that introduced the concepts of the dose-response relationship of exercise, time under load, stoicism in training and other insights that forever changed the field of exercise. 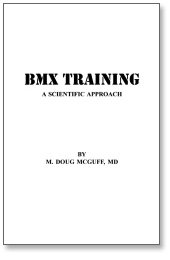 As a former professional BMX racer, Dr. McGuff shows how to apply high intensity strength training principles to the sport of BMX (bicycle motocross). Now an olympic sport, BMX epitomizes the complexity of sports conditioning as it requires strength, power and endurance in the physical realm, and involves multiple skill sets with a need for both narrow and broad mental focus. This book will prove invaluable not only for the BMX racer, but for any athlete who wants to learn how to efficiently train for their sport. Dr. McGuff’s 2 hour lecture to his clients at Ultimate Exercise on the evolutionary biology and biochemistry underlying the optimal approach to diet. A must for anyone looking to optimize their training and body composition. 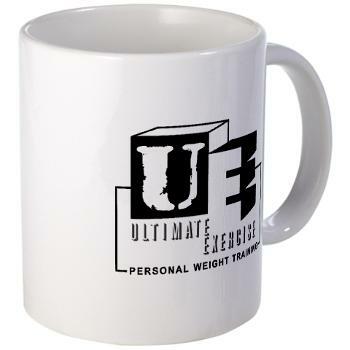 Ultimate Exercise t-shirts, coffee mugs, and more. Shop now!